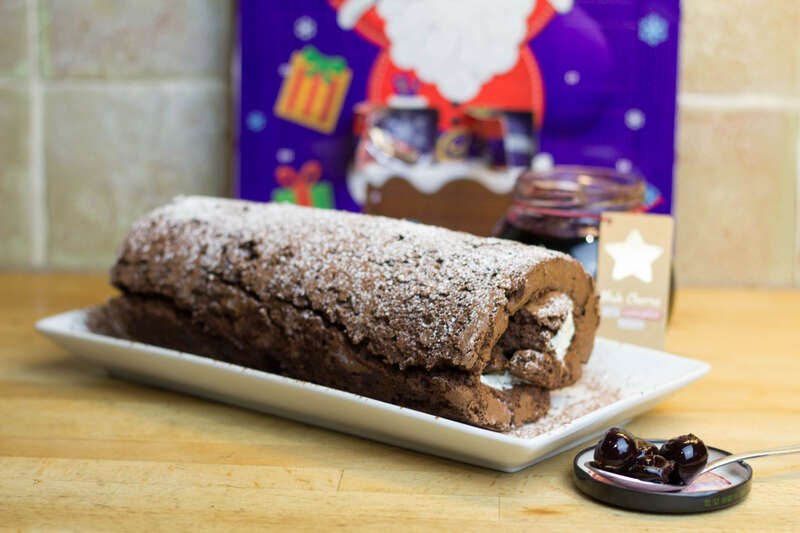 Keeping on the Christmas baking theme, as a kid every year at Christmas we would make a chocolate Yule log. This comprised of a shop bought chocolate swiss roll that we cut to look like a branch and then covered in a ton of chocolate butter icing. Then it was liberally dusted with icing sugar snow and decorated with plastic holly and a robin. We felt like artistic geniuses once it was complete and drove my parents mad on a pre Christmas sugar high once my brother and I had demolished it. This week I was feeling nostalgic and thought it was time to create a more grown up version. As the brain cells got working I thought of blending the height of sophistication of desserts in the late 70s early 80s, the black forest gateau, with a chocolate log. 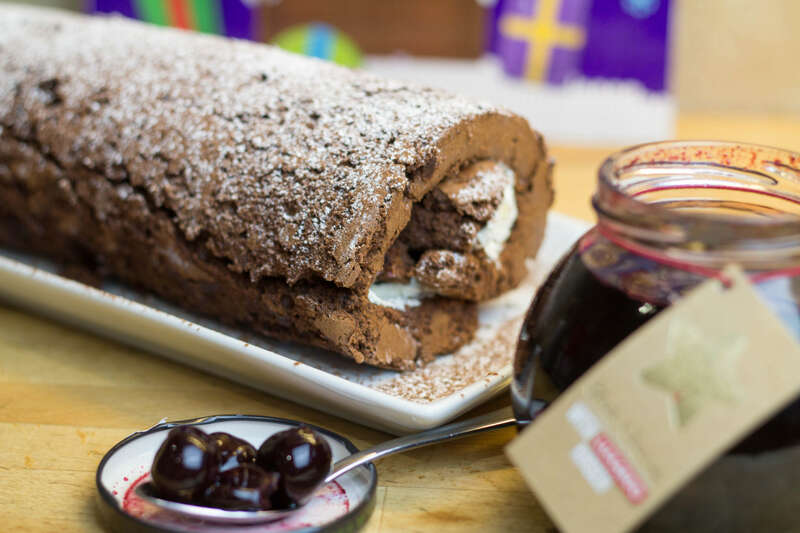 This rich chocolate roulade is filled with thick cream and stuffed full of juicy morello cherries soaked in kirsch. For an extra depth of flavour and kick, I also added some dried sour cherries steeped overnight in vodka. 1. Preheat the oven to 180C/160C Fan and Line a 33cm x 23cm Swiss-roll tin with baking parchment. 2. Melt the chocolate in a bowl over a pan of simmering water (be careful that the bowl doesn’t touch the water). 3. Separate the eggs. In a stand mixer or with an electric whisk, whisk the sugar and egg yolks until very thick and pale. Fold in the melted chocolate. 5. 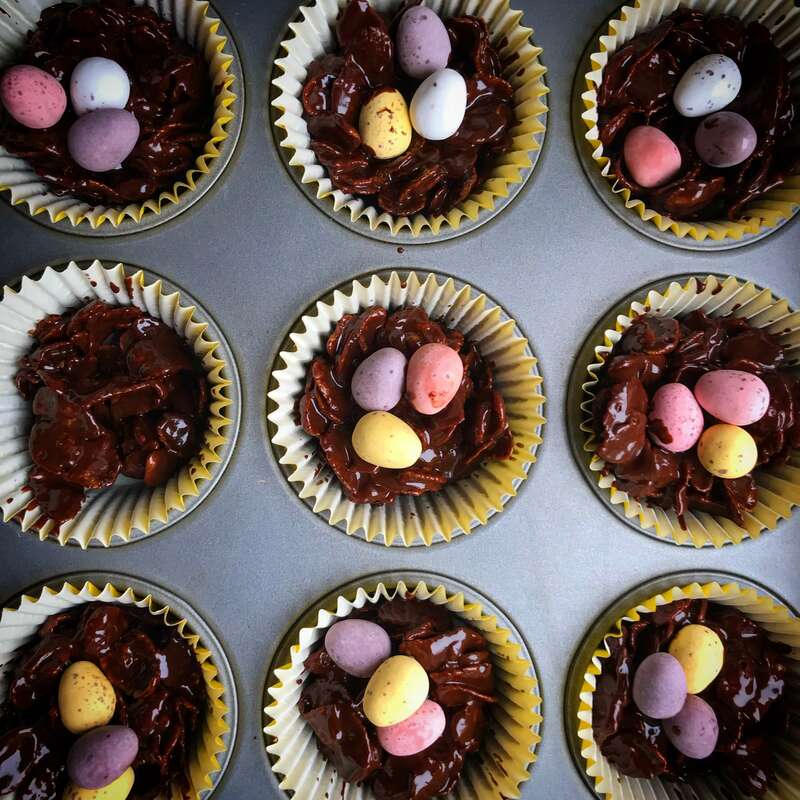 Mix a couple of tablespoons of the eggs whites into the chocolate mixture to lessen it up, then gently fold in the remainder. 6.Pour into the prepared tin and gentle spread out to fill the tin, bake for 15-20 mins until risen and firm to the touch. 7. Lay out a large piece of baking parchment and sift half the icing sugar over it. Turn out the warm roulade onto the baking parchment and cover with a clean damp tea towel. Allow to cool completely. 8. 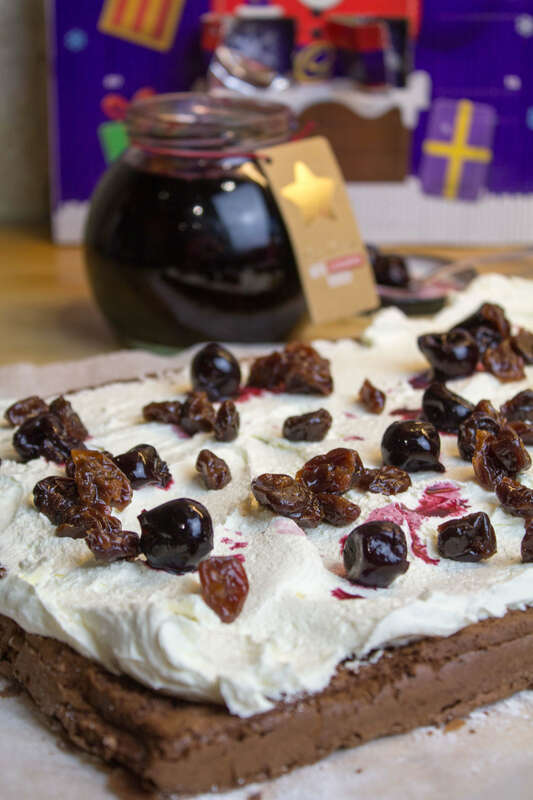 Whilst the roulade is cooling, whip the cream to soft peaks in a bowl. 9. Remove the top baking parchment layer from the roulade and spread with the cream. Then scatter over the cherries and drizzle a little of the kirsch/cherry juice over the cream. 10. Use the bottom piece of baking parchment to roll up the roulade from one short end. 11. Transfer to a serving platter and dust with cocoa powder and icing sugar. Preheat the oven to 180C/160C Fan and Line a 33cm x 23cm Swiss-roll tin with baking parchment. Melt the chocolate in a bowl over a pan of simmering water (be careful that the bowl doesn’t touch the water). Separate the eggs. In a stand mixer or with an electric whisk, whisk the sugar and egg yolks until very thick and pale. Fold in the melted chocolate. 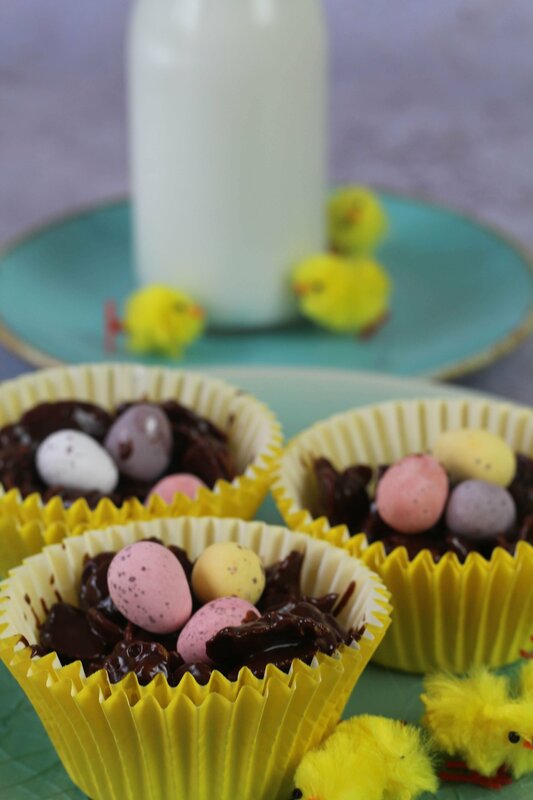 Mix a couple of tablespoons of the eggs whites into the chocolate mixture to lessen it up, then gently fold in the remainder. Pour into the prepared tin and gentle spread out to fill the tin, bake for 15-20 mins until risen and firm to the touch. Lay out a large piece of baking parchment and sift half the icing sugar over it. Turn out the warm roulade onto the baking parchment and cover with a clean damp tea towel. Allow to cool completely. Whilst the roulade is cooling, whip the cream to soft peaks in a bowl. Remove the top baking parchment layer from the roulade and spread with the cream. Then scatter over the cherries and drizzle a little of the kirsch/cherry juice over the cream. Use the bottom piece of baking parchment to roll up the roulade from one short end. Transfer to a serving platter and dust with cocoa powder and icing sugar.